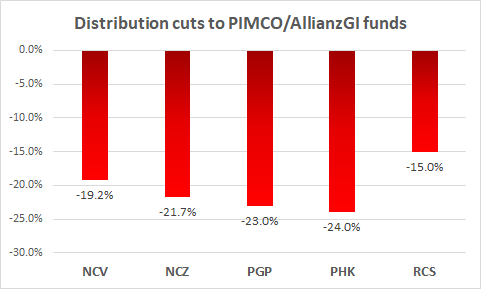 Big cuts were announced to some PIMCO and AllianzGI CEFs. Our analysis of the cuts and AH price reaction. We had expected both sets of cuts to happen and how to avoid suffering large losses from cuts. 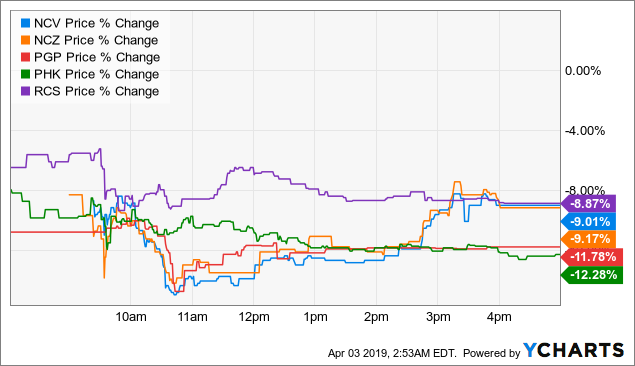 Sweeping cuts were announced after the close on April 1, 2019, to some PIMCO and AllianzGI funds. These changes are summarized in the table below. All of the funds pay monthly and their price change after-hours is also listed in the second-last column below. The market reaction was vicious, with the five funds falling by between -8.87% and -12.28% on the next day. Additionally, total return gains from the last six months were completely wiped out and more. While my sympathies extend to those who held the funds through yesterday, one does wonder whether such cuts could have been predicted? After all, no one likes experiencing income cuts, but the even worse thing, in my opinion, is being saddled with significant capital losses that could take months of distributions to recover from. With the NCV and NCZ premiums continuing to expand, all the while as their NAVs are falling, the odds are stacked against these two funds going forward. 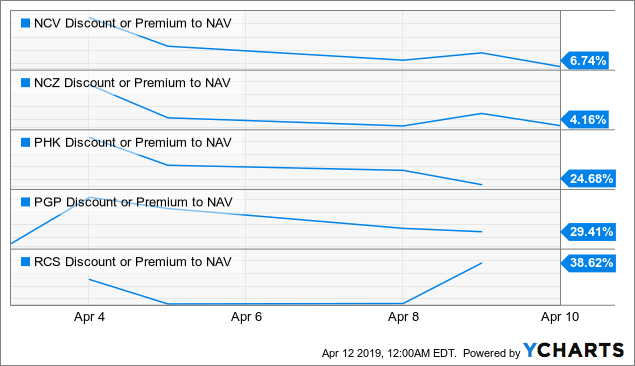 Not only have these funds performed poorly at defending their NAV, but this also opens up the possibility of a distribution cut if management feels that the distribution can't be adequately supported with growth (NII coverage ratios are 82% and 49% for NCV and NCZ respectively). This is especially the case since NCV and NCZ are trading at quite low per-share NAVs of $6.24 and $5.59 respectively, close to the $5 psychological level, and it is telling that the last distribution cut for these two funds were made when that level was approached or breached in late 2015. If I owned NCV and NCZ, I would be swapping out of these two funds into a combination of BCV coupled optionally with a high-yield fund such as PHT, HYT or NHS. Members who heeded our advice to swap from NCV/NCZ to a basket of the four funds listed above when we first released the analysis on September 27, 2018, would have seen an average outperformance of +12.54% over 6 months, sufficient to cover over one year's worth of dividends from either NCV or NCZ. Meanwhile, with regards to the three PIMCO cutters, our "distribution safety scorecard" that we produce as part of our exclusive monthly report on the PIMCO Taxable CEF complex for our newsletter members has been validated as it has consistently shown PGP, PHK, and RCS as having the worst distribution safety scores. Since these funds are so complicated, simply looking at the coverage/UNII numbers from CEFConnect aren't enough. Instead, we have developed a scoring matrix taking into account 5 different factors in order to produce a composite safety score that helps members compare the safety of distributions from these funds at a single glance. For example, in last December's edition, these 3 funds had safety scores of "2", while no other PIMCO taxable CEF had scores lower than 4. On the basis of this and other aspects of research included in the monthly PIMCO Tear Sheet, we have managed to avoid investing in these three funds in our model portfolios and instead chosen other funds with better valuation metrics and distribution safety scores and instead. Moreover, based on this round of cuts, we have further tweaked the model to improve its robustness. Remember CEF investors, don't just look at the yield! This is why I have often remarked that distribution and distribution stability are overvalued. Is there a buying opportunity? The funds have all seen major haircuts to their prices in the after-hours trading session. The following table shows the AH price changes, the funds' old premiums, and their new premiums at the AH closing price. Moreover, the funds' 1, 3, and 5-year average premiums are also shown for comparison. 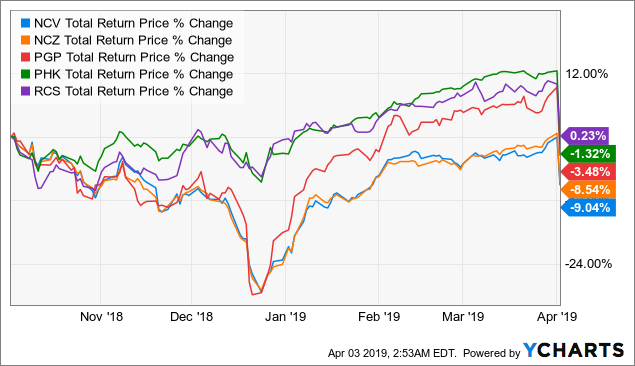 The scary thing about these five funds is that all of them closed near the top of their 52-week discount ranges yesterday. In fact, their premiums yesterday were all significantly higher than their 1, 3, and 5-year average premiums. In other words, investors were majorly bidding up the prices of these CEFs, despite their lack of distribution safety. This is yet another warning that such a mirage of distribution stability can be evaporated in an instant, saddling investors with substantial capital losses, in addition to the prospect of future lower income going forward. While we can't always predict the timing of distribution cuts, we can protect ourselves by avoiding funds trading at irrationally high premiums in the first place. Why not swap to a more undervalued fund and rotate back into the first fund when its valuation reverts back to its mean, thereby allowing you to "compound income on steroids"? How far will the funds have to fall for us to consider them to be buying opportunities? There are three ways to look at this. According to our CEF Watchlist (for members only), PHK and PGP sell above +20% premiums, while RCS is a sell above +15% premium. This would be the most conservative approach, as that is still a long way to fall even accounting for today's AH price changes (estimated AH premiums of +35-40%). 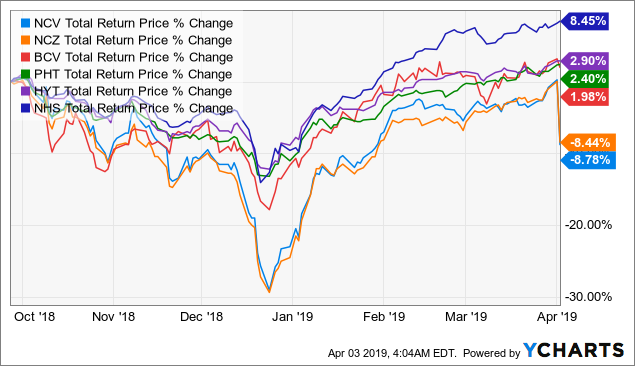 While I understand that these are very low premiums based on their historical averages, I simply don't believe that there is a fundamental reason that these funds should trade at such elevated premiums, especially when there are other, cheaper PIMCO funds to consider that are just as well-performing. I don't currently have NCV and NCZ in my CEF Watchlist, but if I were to come up with numbers, now, I'd have my "buy under" premium/discount to be -8% and "sell above" premium/discount to be +5%. Similarly, I just don't see the reason why these two convertibles/high-yield funds should have much higher valuations than pure convertibles or pure high-yield funds (and there are better alternatives from both categories to choose from!). This is the approach that I would favor for our own portfolios. Based on the AH price changes thus far, it would be unlikely that we will be making any purchases to our portfolios for these five funds. 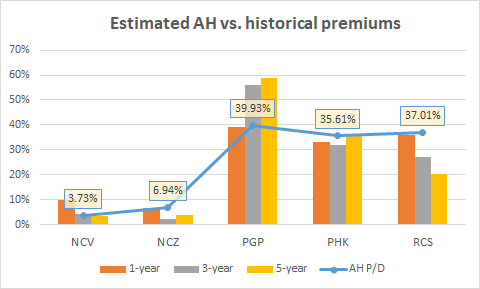 This is especially the case since their estimated premiums after the AH price changes are still largely comparable to their 1, 3, and 5-year historical averages (with some exceptions). An investor who values CEFs purely on their yield would discount the market price of a fund by as much as the distribution was reduced. In order words, with NCV cutting by -19.2%, the fund would have to fall by more than -19.2% for a potential buying opportunity to emerge. If the price falls by less than this, then it would actually have become more expensive than it was before, yield-wise. Consider how much the funds fell during their last round of cuts to frame the expected price change this time around. If the price of the CEF falls by more than it did the last time the distribution was cut, that could represent a potential buying opportunity. What if I already hold these funds? I'd suggest getting out at the open as best as you can, and buy back when the dust settles. If the price gaps down, you'll need to make a snap judgement as to whether or not to sell. Personally I would be comfortable selling any gap down that is not more than -5%, if I owned any of these funds (which I do not) as I think that the price reaction could be vicious. Potentially another warning why buying funds at a high premium can be hazardous to your financial health! After checking out the AH price changes, however, it does appear that all of the funds will gap down. Hence, be prepared to have a minimum price in your mind that you would be willing to sell the fund for, which, in turn, depends on which valuation metric you are using. This price would be one that, should the fund gap down below that price at the open, you would be happy holding on to the fund for the near future, despite its reduced income. In that scenario, consider setting a limit order for this at the open or shortly after the open. I would recommend against using market orders as a possible stampede of sellers at the open could potentially crash the stock, leaving you with little control over the actual sale price. 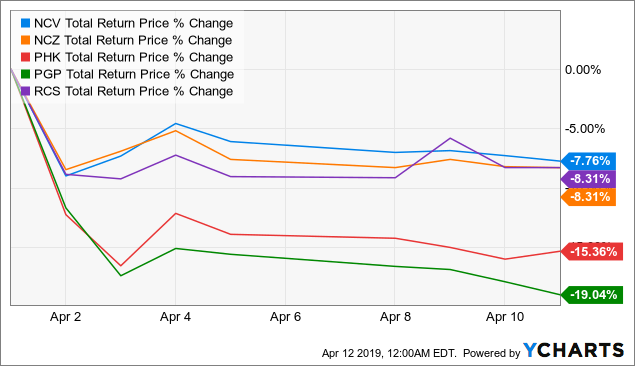 The two most overvalued CEFs from the group, PHK and PGP, continued to fall after the first day after the announcement, while the other three funds have steadied. PGP has now lost the equivalent of over two years' worth of distributions in a little over one week, while for PHK the loss is now 18 months' worth. However, none of these funds have yet entered "buy" territory for our portfolios, based on the absolute valuation criteria I presented above. Hence, despite their negative z-scores, they still aren't interesting to me yet. The capital losses experienced by the funds upon announcement of their cuts amounted to about one year of lost dividends. We had expected both cuts to happen via our regular updates to members and exclusive PIMCO distribution safety scorecard. Remember CEF investors, don't just look at the yield! This report, released on the same day that the cuts were announced, is an example of the timely reports that we produce for members of CEF/ETF Income Laboratory. We're currently offering a limited time only free trial with a 20% discount for first-time subscribers. Members receive an early look at all public content together with exclusive and actionable commentary on specific funds. We also offer managed closed-end fund (CEF) and exchange-traded fund (ETF) portfolios targeting ~8% yield. Also, check out our 5-star member reviews.